Every now and then I need a really girly read. Something sentimental and touching and with enough appreciation of a certain aspect of my life that I can get over how fluffy it is and just enjoy it. In this case, the pleasant writing and wonderful topic of this book made it easy to forget about reading something a little less than literary, and to just lose myself in the girly-ness of it all. There are constant references to vintage designers, and I'm a total sucker for it. The story begins like this: Phoebe Swift abruptly leaves her job as a vintage clothing assessor for high-profile Christie's Auction House and decides to make a go of it by herself. She opens a vintage store in a small England town. And through this she meets an old French woman with cancer, who is looking to sell her vintage garments and ends up telling her hidden secrets to Phoebe. Now...this tugs at my heart strings. In the end, the book turned out to be less about Phoebe Swift opening a vintage store, and more about the stories that clothing tells. What we vintage sellers call the provenance of a piece of clothing - the story behind it that makes it so important. In the book a child's sky blue 1940s coat that the French woman does not want to sell holds a story, which she imparts to Phoebe as she overcomes and deals with the end of her life arriving. It really reminded me how much I love the stories behind vintage clothing. When you buy a piece of clothing, you are continuing the story of that garment. Maybe the last time it was worn was to a gala or ball in 1950, and now you are wearing it to this year's Christmas party. Maybe the owner was proposed to in that dress, or maybe she had a simply glowing time dancing and drinking. And it's that ability to story tell that makes vintage clothing so fabulous. It changes your perspective on the garment, and brings a whole new dimension to what you are wearing. Think about it... a homemade 1960s dress is a charming thing on its own..nicely stitched in a beautiful fabric with a full lining (better quality than you'd find at most stores now!) but what if it was made by...say... Jackie Kennedy. And what if she was wearing it on the day her husband was shot. I'm being overly dramatic here, but only to get a point across: It's the stories tied to the clothing that add not just monetary value, but emotional value as well. For example...I have a strawberry print 1950s dress. I know it came from the estate of a woman who had a twin, and that they often had the same dress made so that they could dress the same. And that makes me immensely happy for no real reason other than that I know some tiny little snippet of the life of a woman who lived half a century before myself. Maybe it's the fact that I have a creative writing degree, but I love a good story. More than finding a great score in a thrift store or antique shop...I love estate sales, because I can learn so much more about a person from their possessions and it opens up a whole new dimension for my purchases. I greatly enjoy passing that on to my customers. If a garment came from an estate of a high-end collector or a woman whose clothing I felt was particularly elegant...I like to impart that knowledge on to the buyer. 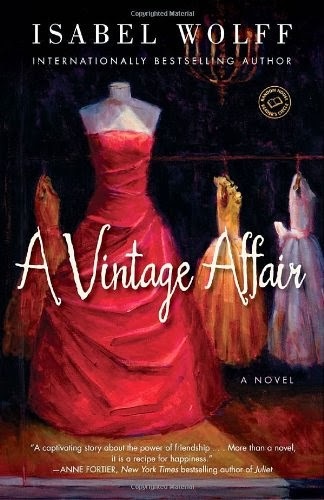 I'd definitely recommend A Vintage Affair by Isabel Wolff as a good read. I think similar to books like Postmistress's Wife or Those Who Save Us. It's a little emotionally trying, but well worth it. And the pretext of the vintage shop and modern relationships eases the burden just a little, so that the book isn't dumping everything on you at once without a chance to breathe. A good read. And maybe next time you go to buy a vintage garment, you'll think about who wore it before, and how much they loved it.